For the 4th session of our Women & ESS seminar cycle, we discussed the issue of governance in SSE with two activists and experts in this field. Here is some feedback on their interventions. 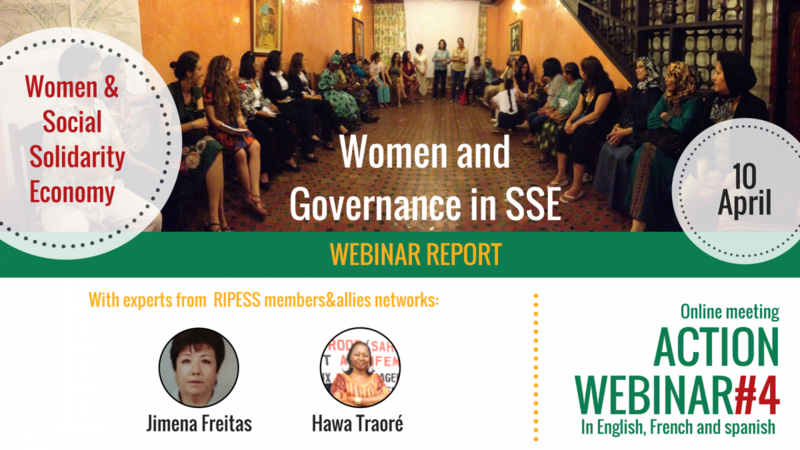 The experiences shared by Jimena Freitas and Hawa Traoré * allowed us to go one step further in our appreciation of the realities, challenges and significant participation of women in governance. We hope that both the webinar and this short summary will help open up paths to concrete actions. You can also download the presentations here (spanish and french). Elise Pierrette Memong Meno (Cameroon), initially foreseen as participant was unable to join. Jimena is a lecturer, researcher and feminist activist in many organizations (Coordinadora de la Mujer- Réseau d’ONGs, Comité Impulsor de la Agenda Política y Legislativa desde las Mujeres, Plataforma de la Mujer). Jimena shared her thoughts on how women suffer from deep inequalities and how SSE could empower them. Inequality issues are the result of a dominant patriarchal culture in the private sphere, an underlying culture that is globally spread through the capitalist model, and that is individualistic by nature. Studies of this are well-known, alarming and yet little considered. To give just a few examples: globally women earn on average between 60 and 75 per cent less than men; domestic chores require between 1 and 3 hours more work for women compared with men; Women’s employment is generally more vulnerable, lower-paid or under-valued. In this context, the SSE represents an alternative that is capable of rebalancing these inequalities by demonstrating that another economic model is possible. However, SSE does not automatically solve the challenge of gender inequalities. To achieve this, the approach must fully include the gender perspective, in order to concretely identify and highlight the levers, especially on the redistribution of domestic and educational tasks. This problem is particularly prevalent in SSE in Latin America, where many initiatives tend to get lost in their strategic gender orientations and move away from their ultimate goal: Women’s Empowerment. Women’s empowerment in SSE must include a redefinition of leadership and governance. We know that property and decision-making bodies are often in the hands of men. However, this is not about replicating dominant and hierarchical leadership, but about creating more participatory, transparent and community-based spaces, where leadership is first and foremost built collectively with inclusive goals. We must stop believing that some people are naturally “predefined” to be leaders. As for men, it is also a question of redefining the term of masculinity, removing its dominant attributes. This new approach paves the way for shared governance, where the power and participation of all are redistributed. Responsibilities remain diverse but relationships become egalitarian. It is this new path that we must promote in our organizations and within the SSE networks. It is in this way that SSE will be able to fully meet its objective of promoting women’s empowerment, redefining the social rules of gender in our societies and contributing to the creation of egalitarian relations in both the public and private spheres. Executive Director of the NGO APROFEM (Association for the Promotion of Women and Children in Mali); joint head of the Gender and Social Development Division of RENAPESS, the National Network for the Promotion of Social and Solidarity Economy in Mali. In Mali, as elsewhere, social and solidarity economy exists. It is anchored in both a strategy of survival and a choice of reorganization of development, thanks to the initiative of actors who want to achieve greater equity in the sharing of power and wealth. Cooperative, mutual and associative initiatives are thriving as an outcome of peasant movements, informal sector movements and community development. And these initiatives not only concern social activities, but also commercial activities as building blocks for a new social project. Women make up the majority of those involved, because although Malian women account for about 51% of the population, they occupy 84.7% of the informal sector, on which a large part of the national economy relies, through sectors such as commerce and crafts, or food processing. SSE’s values, by placing collective interests in its center, lead to new rules of governance, new relationships to power and money. Stakeholder involvement is enhanced through more democratic governance, as are demands for gender, equality, work and decent pay, the use of trade surpluses, capital reinvestment and worker training. In this context, the participation of women in the governance of SSE entities represents major challenges. Firstly, because of the opportunity given to women to be present at decision-making bodies, and to work to influence the definition, development and implementation of economic, social and cultural policies that meet the needs of the SSE actors, in the framework of on-going local development dynamics. Contributing to the improving women’s incomes to promote their economic progress in Mali. Globally, this work is in line with RENAPESS ‘vision of fostering a dynamic partnership between social solidarity economy actors at national as well as sub-regional and international levels, and to successfully influence the definition, development and implementation of national economic, social and cultural policies.